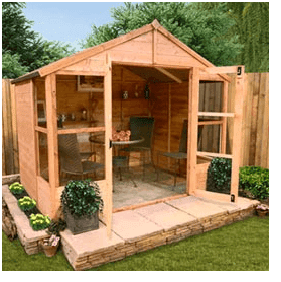 A superb summerhouse that, standing at 8x8ft, is perfect for the smaller garden or for those requiring a little less space than a larger summerhouse. With the front half fully glazed, an abundance of light will fill the summerhouse and show off a fantastic view into your garden. 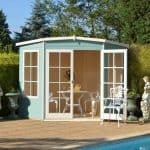 A superb compact summerhouse with wide opening glazed double doors and feature, functional glazed windows. Ideal for a small garden space or if you want something compact but still with beauty. Constructed from long lasting and hard wearing wood with tongue & groove cladding for extra strength and durability this piece will stay the distance. The higher grade felt on the apex roof gives this summerhouse extra weather protection and we believe this to be the ideal place for some R&R not to mention practising your favourite hobby. 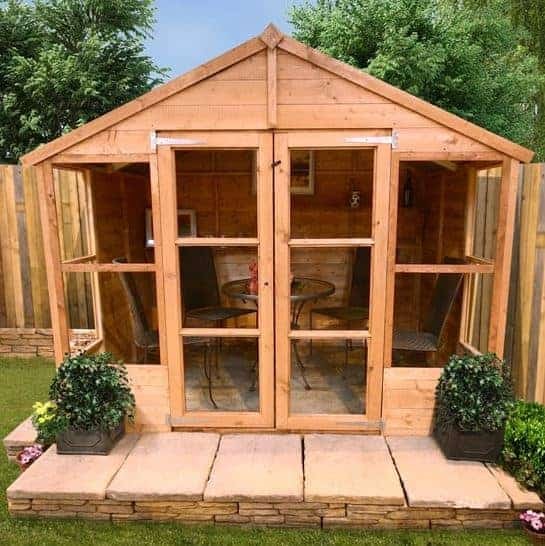 The tongue and groove texture of the timber gives a nice, natural finish to the summerhouse enabling it to blend into its natural surroundings however it would be possible to paint your summerhouse to give it more character or to match other items within your garden. 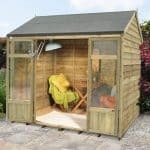 The 8x8ft interior space provides enough room to hold a small table and chairs, other garden furniture, hobby items or of course gardening projects. 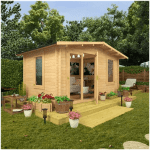 When looking to purchase your dream summerhouse for your garden, a place which you will want to spend many hours year round, particularly in the summer months, you want to be sure that you are choosing the best model for your needs. With many models of different sizes, features and prices, below the team at whatshed.co.uk will look at this particular model’s many features in order to help you make your purchase decision. Exterior: The tongue and groove timber cladding of this attractive summerhouse give it a traditional feel whilst the large amount of glazing on the front half of the structure give it a more modern look within your garden. 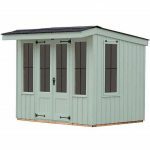 Constructed from thick, hard wearing wood, this summerhouse has extra weather protection with its special finish. Interior: The 8x8ft interior provides adequate space for an individual or couple to enjoy relaxing or their favourite hobbies inside. 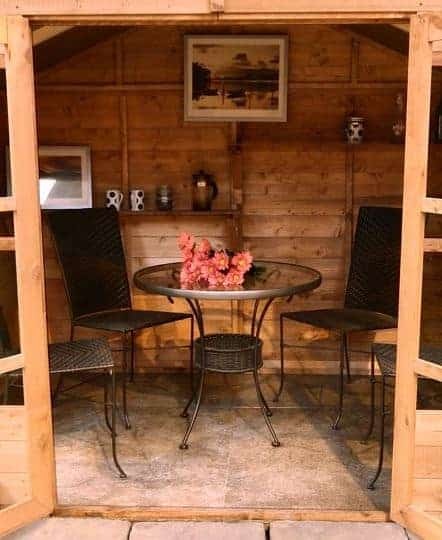 By adding your own furniture you can make the summerhouse as homely as you wish. Another use would be for a keen gardener to use the space for their gardening projects, with ample light and the fabulous views out to the garden, this would make a fantastic space for your plants to flourish in. Windows & Doors: The large paned windows that make up the front half of the summerhouse give the structure a light and airy feel. Although the windows are not able to open, the large double doors, which are also glazed, make up for this by letting fresh air circulate throughout the interior should you wish to leave them open. Security: No security fittings are included in the package, however it is possible to add a padlock or similar security fixture to the double doors in order to make them more secure (security fixtures can be purchased separately). 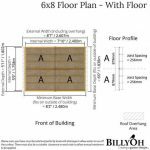 The Billyoh 4000 Tete a Tete Tongue & Groove Summerhouse: How easy to build? Billyoh have listened to their customers views and made their parts smaller and more manageable to handle during the assembly process. This means that this summerhouse could maybe be built by an individual, however due to the size of the summerhouse and for a less time-consuming assembly process we recommend that a team of two people work together. 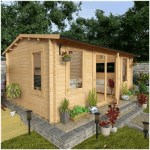 We expect that this summerhouse could be built within a day following the step by step guide with detailed instructions and easy-to-follow diagrams. A basic tool kit will be required but all the parts, fixtures, fittings, nails and screws will be provided as part of your package. 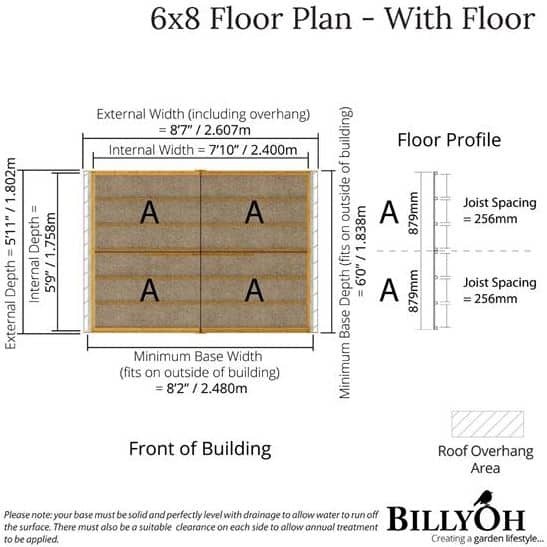 The Billyoh 4000 Tete a Tete Tongue & Groove Summerhouse: What is the overall quality like? Billyoh designs and manufactures its products within the UK and is well known for its premium garden buildings that make a stylish addition to any garden. Every model is designed with the user in mind – what is important in a summerhouse and they can design a model to best reflect these needs. The BillyOh Tete a Tete summerhouse is constructed from high quality, hardwearing timber that provides your summerhouse and its contents with year round weather protection from the elements. 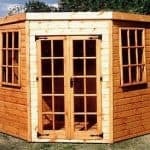 At whatshed.co.uk we love the natural look of the summerhouse as it is, however you are able to paint your summerhouse if you wish to add a personal touch or to match existing pieces within your garden. To maintain your summerhouse’s smart appearance simply clean by hosing down with water or by using a soapy solution with a sponge on the glazing to make those windows sparkle. What a wonderful way to enjoy the fabulous views out to your garden in comfort, with such huge windows taking advantage of the light and views available. A modern glazed style mixed with traditional tongue and groove timber give this summerhouse a unique feel. At this lower mid-range price you certainly get a lot for your money – space, style, and an abundance of light and views – a fantastic buy!